What was your first encounter with Tim Leary? After writing Angel Tech and self-publishing a limited first edition of 300 copies, I sent one in the mail to Tim in the hopes of achieving his endorsement yet clearly not expecting it. I was some unknown thirty-year old kid who wrote a book based on a system he had already established and published years before. So I was seriously gob-smacked & flabbergasted when he mailed me his endorsement. That was my first encounter. About a year later, Tim was invited to speak at the University of Colorado in Boulder where I also resided. The folks who organized that talk knew of my book and invited me to join them for a dinner with Tim. When the time came around, I sat down at the dinner table next to an empty chair. Tim entered the room laughing and talking with one of the sponsors of his talk and then, he sat down next to me. I immediately froze in the grips of idol worship, wondering what to say or if to say anything at all. I introduced myself as the guy who sent him the book Angel Tech. He looked me in the eye for one long twinkling silent moment and then he said, "I like your mind." 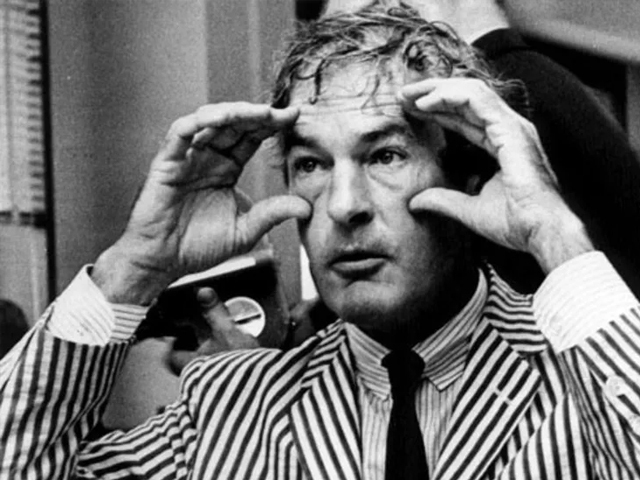 My first impressions during my dinner with Timothy Leary was how funny and fluid and honest he was around speaking his mind but also listening very carefully to what others were saying. This combination of utter candor and genuine social receptivity struck me with the impression that Tim Leary may be the most intelligent person I've met so far. Since my books and his previous books on the Eight-Circuit Brain model examines Intelligence through a far greater spectrum than I.Q. alone, when I say Tim may have been the most intelligent person I've met do far - I mean, genius. You are also an astrologer - have you ever looked at Tim's chart? Any fascinating insights there? Though I don't identify myself as an Astrologer, I have studied horoscopes for over thirty years and plough my trade by interpreting the charts of others. I honestly have not examined or interpreted Tim's chart beyond a superficial look-see. This reflects my habit of shying away from over-analyzing those who matter the most to me in one way or another. With that said, his chart has all the hallmarks of a genuinely creative soul, a skeptic unafraid to speak his mind, a passionate lover of beauty and a relentless mental detective of ideas labeled taboo by society. When did you encounter the 8 circuit brain model? What were your first impressions? I first became aware of the eight-circuit model in Robert Anton Wilson's book, THE COSMIC TRIGGER back in 1979. My first impressions? Astonishment, wonder, and intense curiosity. Though I knew that no one map or model could ever explain or cover the wild spectrum of human experience, the eight-circuit model excited me with the possibilities of interaction within the model. I was impressed by how each circuit linked with other circuits and how the states of consciousness and functions of Intelligence that the circuits symbolized might be accessed, integrated, and even embodied. I wanted to be an eight-circuit man! In 'What does woman want?' Tim tells a wild story about how he came upon this material - Is he pulling our legs? Who knows if Tim was pulling our legs and does it matter? Was Castaneda pulling our legs with his tales of Don Juan and Don Genaro? Whether it's true or not, I choose to accept the story that a Rutger's professor of Religious Studies visited Tim during his Milbrook days (early sixties) and sharing with him an oral tradition of an esoteric chakra initiation. It may seem like a wild story now but back in those days, a lot of wild things actually happened. What is it about this model that so impressed you? When did you decide to build on the model? Was 'Angel Tech' your first project in this realm. Throughout 1979, I read Wilson's 'Cosmic Trigger', Leary's 'Exo-Psychology' (later retitled Info-Psychology) and Wilson's 'Prometheus Rising'. In 1980, I was still young and audacious enough to think I could actually advance the model. I decided that the only way I could do that was by bridging all of Leary's theoretical material with actual tasks, rituals, meditations, and other devices that might trigger the very states of consciousness and functions of Intelligence that the circuits symbolized. My previous background in dance and theatre informed a deeply embodied bias. I was always looking for ways to apply ideas to action, emotion, and a more direct experience. I am not a theorist. l don't have much tolerance for ideas and beliefs that cannot be applied to action or derived and distilled from real life experiences. This embodiment bias serves as my greatest strength and limitation. 'Angel Tech' was my very first project in this realm. On the 'Angel Tech' blurb Tim calls you a "frontier scout for the species, out there on the rim where the past and future intersect" - do you identify with this role? Leary's endorsement quote was, of course, very flattering but in truth, I don't personally think of myself that way. Maybe that's for other people to decide or think of me that way. I prefer to keep my inner life as free from self-images, or fixations on any idea of identity, as possible. This adjustment leads to an internal receptivity that serves my creative and artistic processes far better than any self-image, no matter how wonderful or flattering. Apart from the book review did you and Tim discuss the model much? Do you think your understanding of it and his differs in any particular way? Tim and I never discussed the model together. Our understandings of the model are alike in some ways and different in others. Tim was far more of a theorist than I am. Bob Wilson once told me that Tim's nickname during his Harvard days was Theory Leary. I think Tim may have been amused and intrigued by the steps I had taken to bring his theories into action through the plethora of methods, techniques, and rituals I designed to evoke the experience of the energies innate to each circuit. How did the online training courses for 8 circuit brain come about? Back in 2004 or 2005, Lance Bauscher contacted me about his online educational format, Maybe Logic Academy, based on studies related to the written work of Robert Anton Wilson, Timothy Leary and other authors. He invited me to run a course on the eight circuits as presented in "Angel Tech". At first I declined his kind offer as I could not see how an online course could ever engage people in this process. However, with his gentle and reasonable encouragement, I gave in and designed an eight-week format that I ended up teaching through MLA over the next few years. This course proved far more successful than either Lance or I expected. The course also turned me onto hundreds of genuinely bright inpiduals out there who had read my book and were interested in the possibility of interacting with me about their experiences with this model. I learned new ways of interacting with others from that experience, like how to address issues and problems with those for whom English was not their mother tongue. I also learned a lot about myself in the process. Your second book about this material ,"The 8 Circuit Brain: navigational strategies for the energetic body", is much more of a user manual combined with autobiography while Angel tech feels more stream of consciousness. What was the reason for writing the 8 circuit brain? Why did you combine it with the story of your own journey? Truth be told, I did not want to write this book. Writing books is the most difficult thing I know how to do and the idea of presenting a highly abridged advancement of the Angel Tech material haunted me for years as a daunting enterprise at best. Why did I eventually do it? As I was approaching sixty at the time, it dawned on me that I could not write this book for myself alone. I needed to write this book for the generations born after mine. It was for them, not for me, that I wrote this book. I took a year off from my MLA course and refined the structure of that online course and published the entire eight-week format in this book that I chose to call "THE EIGHT-CIRCUIT BRAIN: Navigational Strategies for the Energetic Body" (Vertical Pool Publishing, 2009). The subtitle refers to the additional material in this book that utilizes methods of paratheatre to access the circuits in a more embodied way. Now anyone with enough time, motivation, and commitment could take the course alone or with friends for the nominal price of the book itself. Though I no longer teach at MLA, I do run an 8-week online course on my own website (verticalpool.com) once a year starting in March that uses this book as a primary syllabus. I also felt it would be an honest gesture to share the story of my own journey in the final and fourth section of the book, "How I Got This Way". Since I've been using myself as the instrument for all my circuit experiments, I thought it only fair to share something of my actual life story as seen through the context of the circuit model. This story was written within the structure of a series of hedonic upgrades, of how I moved through a series of experiences that got me high and how I outgrew most of them. Do you think between Tim Leary, Anton Wilson's work and your books this particular 'map' is pretty complete or do you feel there is still a lot of room for other researchers to build upon this material? That's difficult to say. Between the three of us, we do cover an awful lot of ground. But I suppose anything's possible. I have been approached by a handful of folks over the years espousing their massive ideas of writing the Next Big Eight Circuit book but so far, nothing has come of it. A simple fact gets in the way - it's a lot easier to grasp these circuits and the whole model conceptually than it is to find or create mediums for its expression and manifestation that does not trivialize the system or that has not been done before. I'd like to see the Eight-Circuit Brain model taught in schools. I think that can arouse more hybridizations of the model and other novel applications by 21st century minds that have yet to be born. Could you please share an insight or conception you have about Tim Leary which may not be common knowledge? OK. I'll share an experience that might shed light on your question. Tim asked me "what does woman really want?" And I said, "I don't know. What does woman really want?" He then leaned over and whispered into my ear: "Everything."